Recently I saw a Library Postcard Flickr Pool with some very nice cards. I too have a (very) small collection of library postcards – all illustrate libraries from places I’ve been or from places my family members lived. None of these were scanned or listed. I shall have to add that to my ‘to dos’. I’ve now uploaded a couple of library cards to Flickr. This should motivate me to scan and upload more soon. 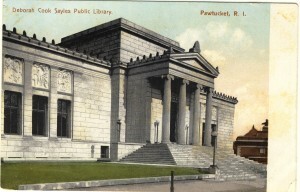 This postcard shows the Deborah Cook Sayles Public Library, Pawtucket, Rhode Island, USA. This historic building, opened in 1902, is still in use and was named in memory of Deborah Cook Sayles, who was born in Pawtucket and active in community work, and the wife of Frederic Clark Sayles, one of Pawtucket‘s mayors. There were other things about the library that interested me, besides its architecture. It was one of the first to open on Sundays, so that mill workers could use it, and apparently one of the earliest to allow younger children in. Some of my relatives from West Yorkshire (HEALEY, WOOD, WOODMAN) emigrated to Rhode Island and lived out their lives there.